Using 2.0 works fine but upgraded to 2.1.2 and every time I try to add a map it crashes the program. I can start a new project just fine but if I add a map to the project it crashes. Trying to open an existing project works until it tries to load the map and it crashes. Anyone else have this problem, any ideas how to fix it? Thanks! could be a bad install/upgrade. Have you tried a repair? Thanks for the response. I tried a repair and even uninstalling and reinstalling but still get the same bug. So, new projects work but any existing ones do not work? Or is it only specific existing ones? Maybe it would be a good idea to contact Esri Tech Support on this? Hi Adrian, no projects are working either new or existing. As soon as arcGIS tries to open a map or scene the program crashes. Definitely going to contact tech support, it just happened over a weekend and they weren't available so I was hoping maybe some one already encountered the issue and knew of a fix. Grant Rawson Are your Map and Scene options set to Default? Or do you have this set to a custom basemap? Thanks for the info, I checked the setting and everything is set to default like you have in the picture, but it's still crashing every time. I'll try tech support and see if they have an answer. You should still open a case with tech support, but in the interest of helping to figure this out, send the report. I am having exactly the same problem and have followed the suggested steps above. Are you still working on this issue? Thanks in advance for any guidance. Paul. What version of ArcGIS Pro are you running? 2.2.3 is the most current. You said you're encountering exactly the same issue. So every time you add a map to a project, any project, Pro crashes? How do you have your Map and Scene options set up in Application > Map and Scene? If you go to that ErrorReports folder and look at the size, how big are the .dmp files you're seeing? "By default, error reports are sent to Esri through a web service. 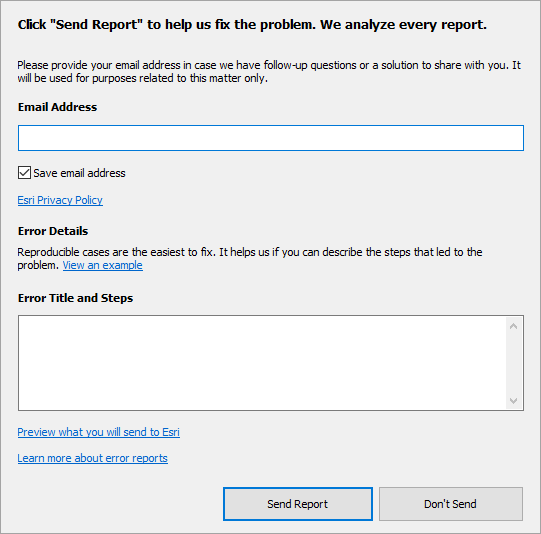 However, if you don't have Internet access when the error occurs, you can attach the report to an email and send it later toArcGISErrorReport@esri.com. Error report files have the extension .dmp and are saved to the application data location on your local hard drive, typically C:\Users\<User Name>\AppData\Local\ESRI\ErrorReports. The 10 most recent reports are saved." I get a message saying that it is too large to send so I have to email it instead. Looking at my last 10 reports, some are around 20 MB. Adrian, just messaged you. Let's get your email and I'll set up an ftp. Was this issue ever resolved? My program gets stuck every time I try and open a scene or a new map. It gets stuck with the following bar scrolling across as if it is actively working on opening a new map, but nothing happens. I have tried both a repair and an uninstall/reinstall. One thing I would recommend is updating your GPU video driver. Go to Device Manager->Display Adapters and note the make/model of your video card. Go to the manufacturers website, download and install the latest driver. Does the issue persist? Ok, I think I'm able to narrow down what is causing the issue. It's not the act of opening, but it is the act of drawing or adding anything to a map. I can create a new map with no basemap (empty drawing) and everything works fine. As soon as I add anything to it (create empty feature class, ESRI basemap, shapefile), then the program goes into an endless cycle of processing (most options are greyed out in the menu). Not sure if that helps narrow down what the issue is at all. (one GPU at a time! ).